The Red Hill, Vincent, and Gershome neighbourhoods make up the Red Hill Neighbourhoods area. 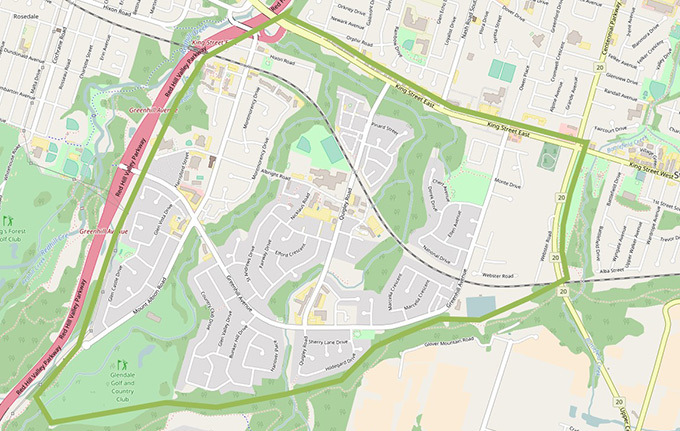 The Red Hill Neighbourhoods are bordered by the Red Hill Valley, the Niagara Escarpment and Glendale Golf and Country Club, and Centennial Parkway, and lie south of King Street East. The Red Hill area contains mostly detached homes on generously sized lots, and quiet streets shaded by beautiful mature trees. While there are few shopping amenities immediately within this largely residential neighbourhood, its spectacular views of the Niagara Escarpment, nearby trails and greenspaces, and close proximity (5 min) to any of the nearby shopping and commercial districts found on Centennial Parkway, Queenston Road, and Heritage Green (at the top of the Red Hill Valley Parkway), make it a highly desirable area to live. Nearby neighbourhoods include Rosedale, Glenview, Korman, Greenford, Battlefield and Albion Falls.